It can be easy to overlook the links in England when booking your golf package, especially when you have such storied neighbors like Scotland and Ireland nearby. 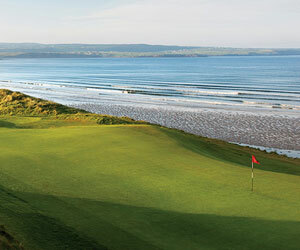 Even Wales has made tremendous gains in British Isles golf tourism of late. England's golf courses easily hold their own, however. The sheer size of the country helps, as it is home to plenty more courses, but the quality of it's elite clubs are as good as anywhere in the British Isles. England is, of course, home to several Open Championship hosts currently in the rota - all of which offer outside play. The Northwest coastline, about a 50-mile stretch from Liverpool north to Blackpool is England's most acclaimed golf tour. It's home to the legendary Royal Liverpool golf course, Royal Lytham & St. Annes and Royal Birkdale. Two hours southeast of London is Royal St. George's, not to mention former Open host, last held in 1920, Royal Cinque Ports. You'll also find a collection of parkland golf courses around London, most famously Wentworth, along with Walton Heath and Sunningdale. Mix a links golf tour of any region with centuries old castles and beautiful English landscape, and you have a recipe for success in England.